Just recently time has absolutely passed us by so quickly that we haven’t visited half the places we’ve wanted to. This weekend we finally made it up to the Newest Kid on the (Somercotes) Block, namely Curry Lounge (formerly the Groundworks building). We arrived on foot at about 7.45pm and the place was really buzzing with diners already including family groups celebrating, couples and groups of friends. One of the very smartly monochrome attired staff showed us to a vacant table and we cracked our bottle of wine open to toast the start of the weekend. 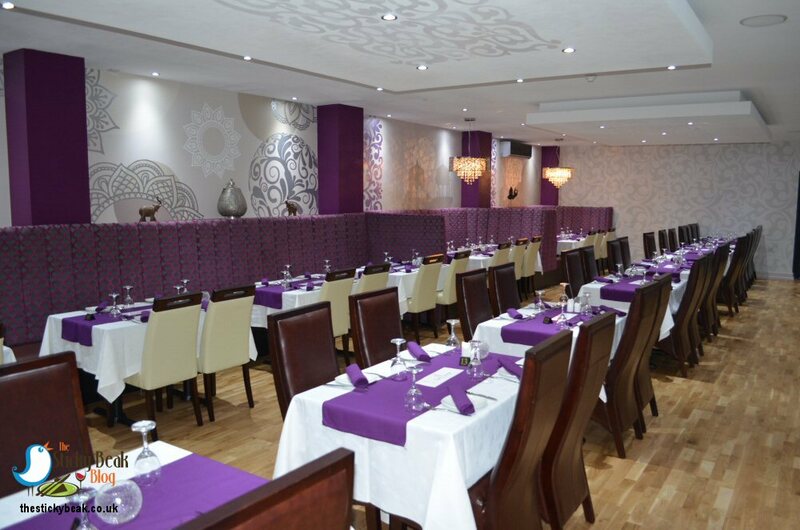 The premises themselves are lovely and open plan with purple patterned banquette seating down one side of the room for the first row of tables; there are a further two rows of tables but they are all spaced nicely to allow privacy to be maintained. At the far end of the restaurant there are some feature chandeliers that throw beautiful reflections onto the ceiling and the rest of the light is provided by recessed spotlights. All the tables are laid with pristine white cloths, overlaid with purple runners and set with immaculate cutlery. 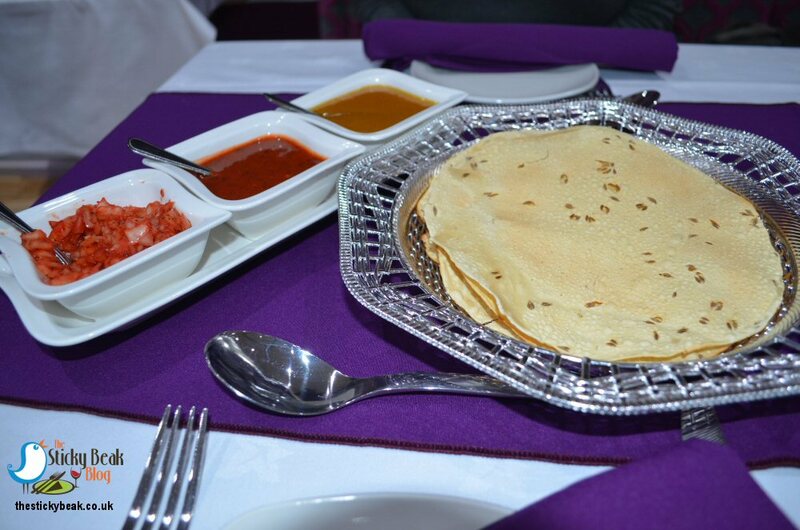 To kick things off we ordered two of the spiced Poppadoms each and the pickle tray to munch at as we looked at the menu further. The Poppadoms were superb; really freshly made and you could see and taste the fresh seeds in them (I’m sure I had cumin seeds in mine) which woke the palate up very nicely. There were three pickles to choose from; the usual finely chopped Tomato, onion and herb pickle, a wonderfully hot tomato pickle that was a thick sauce consistency, and a great mango relish. All three pickles were lovely and in all honesty neither of us noticed that there wasn’t yoghurt and mint sauce until it was brought out with our starters. 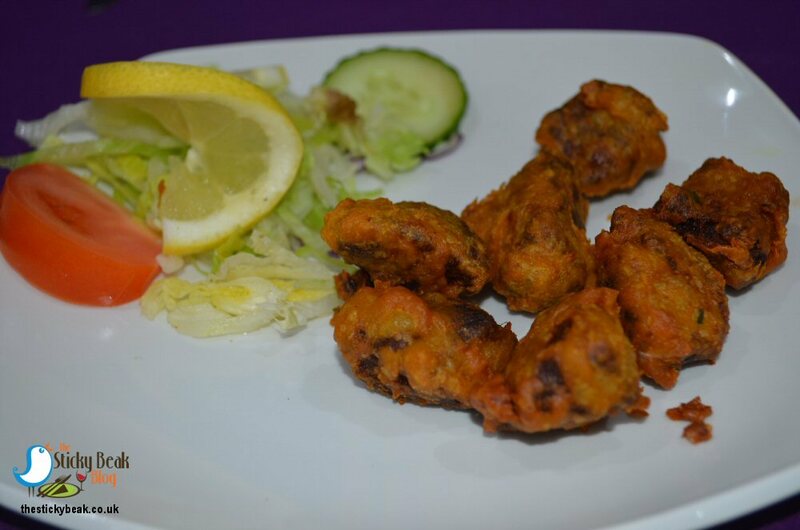 For starters we had chosen Lamb Pakora and Fish delight. 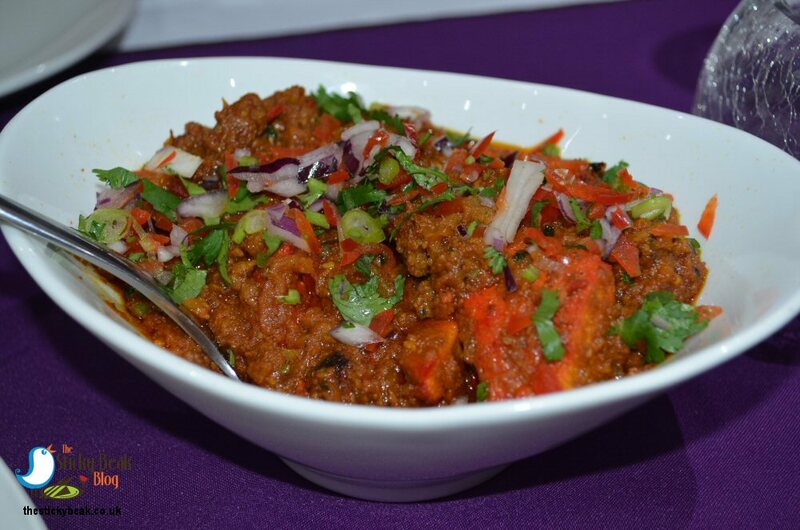 The Man Birds Lamb Pakora was made of minced Lamb that had been mixed with special spices before being deep fried. He said that it was very flavoursome and had a great texture to it, and judging by the speed it got devoured I think it safe to say that he thoroughly enjoyed it! 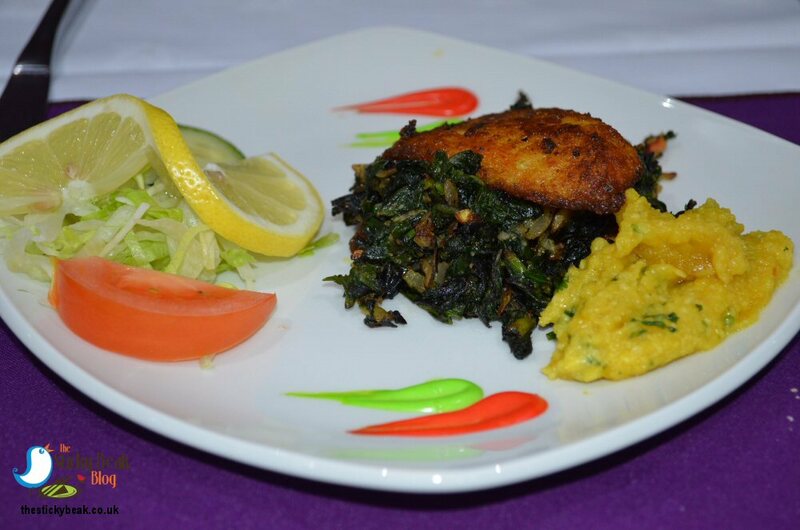 My Fish Delight is lightly spiced grilled fish that is served with toasted Spinach and spiced Lentils, and it looked superb as our server brought it out. The fish was lovely and moist; one of my bug-bears is overcooked fish as you know, so I was very happy with his delicious morsel. There was just enough spice to appreciate it on the tongue, but it didn’t overpower the white fish at all. The fish lay on a bed of Spinach that was nicely wilted and lightly buttered and I loved the spiced Lentils, they were deliciously vibrant in the mouth. 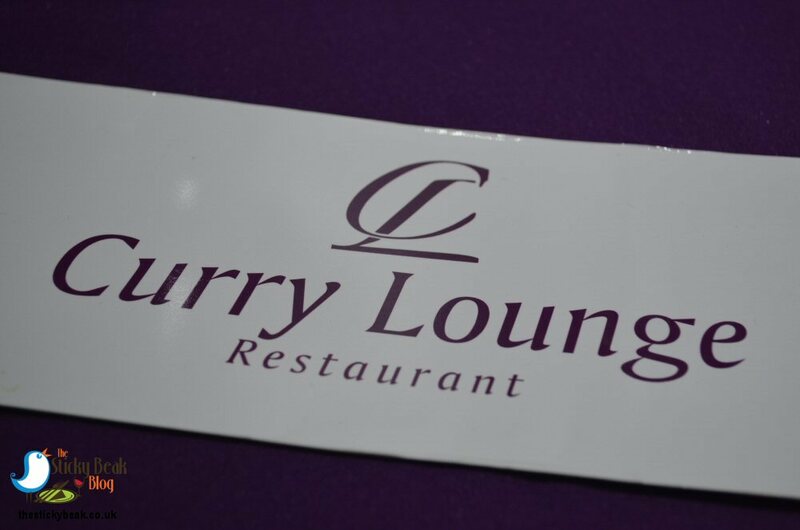 With this being our first visit to Curry Lounge we really wanted to get a feel for the food, so we both chose a dish from the “Signatures” section of the menu. The Boy Wonder had the Murghi Masalam; a medium strength Chicken curry that is cooked with chicken mince, potatoes, Tomatoes, and fresh Coriander. 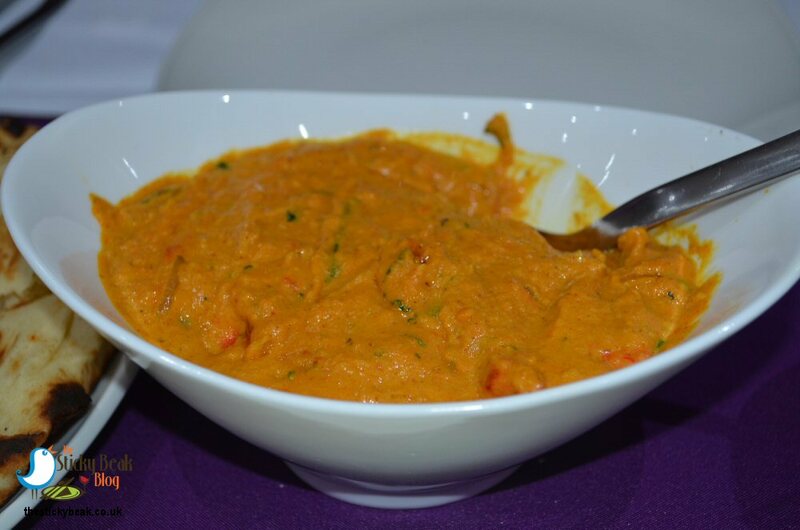 This had a great amount of both chunks of chicken and minced chicken which gave a great contrast of textures and it was cleverly spiced so that you got all the flavour without it being mouth-tinglingly hot. I had the Coco Rani dish which is chicken cooked in Goan Masala with fresh Coriander, Green Chillies and Coconut milk. This dish was a skilful balance of creamy mildness from the coconut and heat from the fresh Green Chillies that really came to life when eaten. There was plenty of chicken in the curry, so my tummy was filling up quite nicely. We ordered a portion of Lemon and Chilli rice and a Peshwari Naan to share between us, and both of these were delicious. 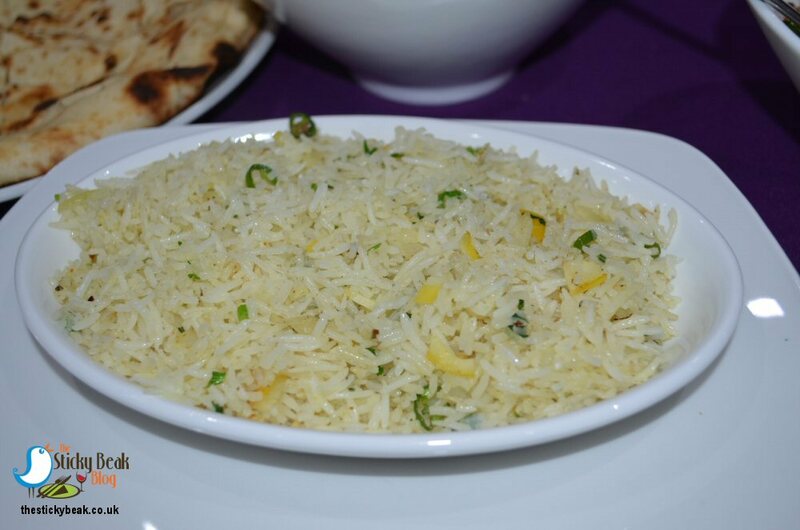 The rice had tiny pieces of lemon rind in and finely chopped green chilli; the vibrant colours were visually appealing and it tasted great too. 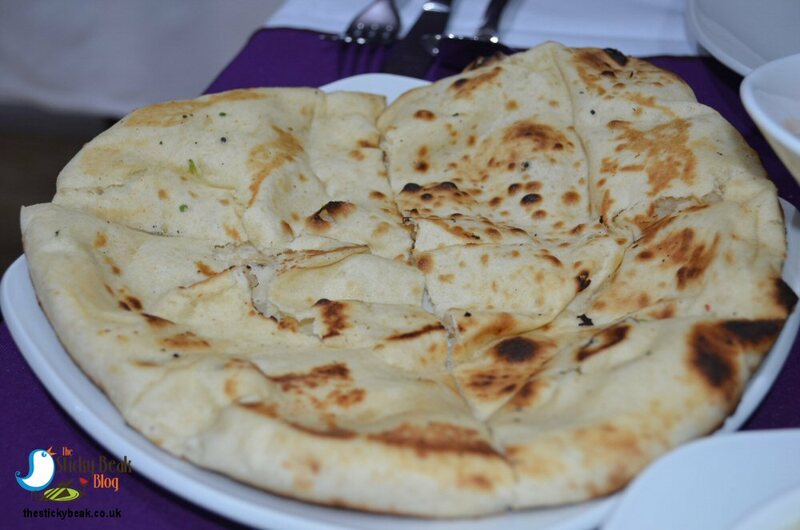 Nothing beats pillowy soft Naan bread, except a pillowy soft one that has been freshly cooked and is comfortingly warm and the Curry Lounge version was magnificent. At the start of the evening we had decided that we were going to be good and skip pudding; needless to say after a couple of bottles of wine our resolve was nowhere to be seen! I opted for the Ferrero Rocher Gold dessert and The Man Bird chose the Salted Caramel dish. 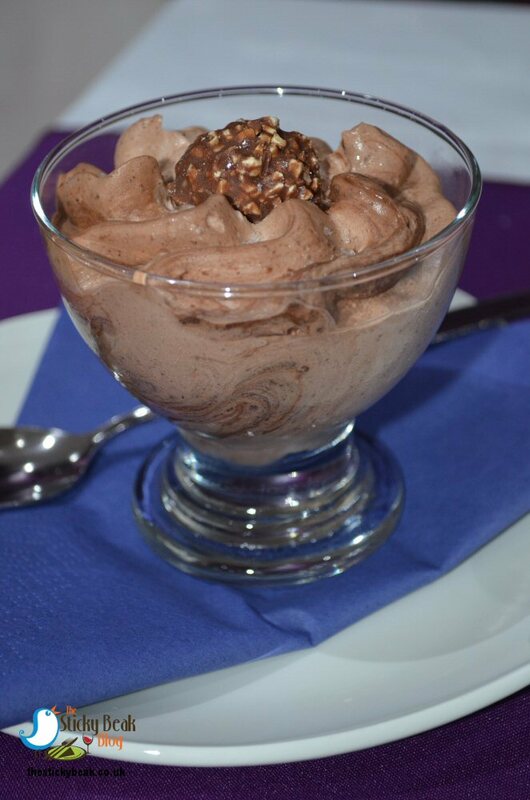 My dessert is Ferrero Rocher Ice Cream swirled with a thick Chocolate sauce and topped with a Ferrero Rocher chocolate. It was blooming good, let me just sayJ. The ice cream was very moreish and I could seriously finish off a tub all to myself and feel no guilt whatsoever (well ok, maybe a smidge of guilt). 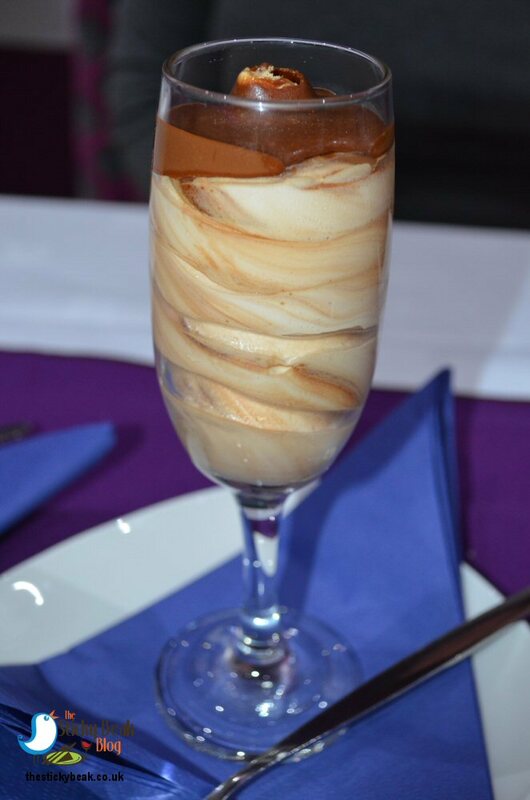 His Nibs was busy tucking into the glass filled with rich Salted Caramel ice cream that had swathes of chocolate toffee sauce rippling between it. I think he would’ve put his finger into the glass and scooped every last bit of ice cream out if there hadn’t been other diners close by! One important detail that I feel needs sharing with you all is the fact that the ice creams were at a perfect degree of “meltiness” so that you could eat them at speed without getting the dreaded brain freeze. Perfect.